Yesterday SPERI held our first teach-in event on ‘Corbynomics’ to explore the economic policies being put forward by the new Labour leader Jeremy Corbyn and his new Shadow Chancellor John McDonnell. We were joined by three excellent speakers – Dr Jonathan Perraton, SPERI Associate Fellow in the Department of Economics, Dr Mary Robertson, Postdoctoral Research Fellow in the economics division of Leeds University Business School and Professor Andrew Gamble, SPERI Professorial Fellow – who led the debate. Our three speakers set out their views on what the key components of Corbynomics are, why it’s important to be having a debate around the ideas, and whether the ideas are in fact new or a revival of economic policies from previous decades. Videos of each of their contributions will be published on the SPERI Youtube channel next week. 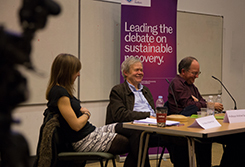 The event was chaired by SPERI’s Scott Lavery. We took questions and comments from the audience as well and the event drew a lot of comments on twitter. We’ve put together a storify of the event which features photos and tweets from the event – read it here. Look out for blogs on Corbynomics from Andrew Gamble and Jonathan Perraton which we will shortly be publishing on the SPERI blog.